A Rhode Island man says he wants to right a wrong that may have been done by a relative accused of vandalizing graves. Mike Montanaro spent part of the Fourth of July weekend at St. Joseph Cemetery after reading that his cousin was one of two people charged with stealing and selling bronze markers from graves in the West Warwick cemetery. 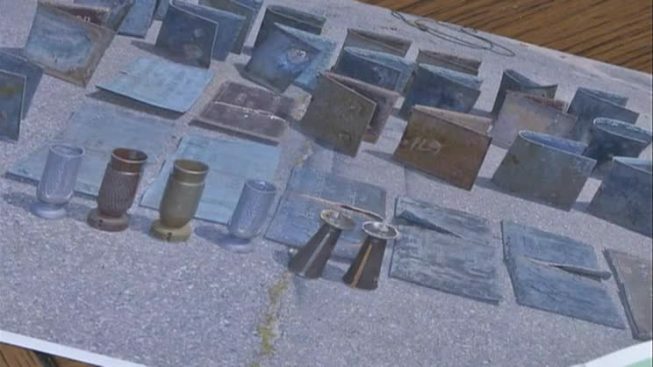 Police say 29 bronze markers, worth nearly $23,000, were stolen from World War I, World War II, and Vietnam Veterans. With help from a neighbor, Montanaro is placing flags at the graves of veterans whose markers didn't have one. He says it was a way to give back and do something positive for the veterans. He says he now wants to make the flag placing an annual tradition.